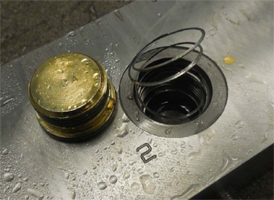 To document the effectiveness—and the name—of the Zero-Leak Gold sealing method, we have commissioned a variety of tests by the Fluid Power InstituteTM located at the prestigious Milwaukee School of Engineering. See the impressive results our products delivered below. The Zero-Leak Gold product line of EPCO Products, Inc. a Fort Wayne, IN based company, is a revolutionary line of Zero-Leak Gold plugs and fittings. The fittings developed a zero leak seal at very low assembly torque values and EPCO wanted to determine more accurately the torque values at which the fittings would not leak under accepted industry practices and established measuring methods. 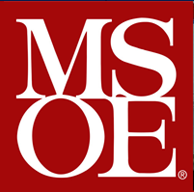 Evaluation at Milwaukee School of Engineering (MSOE) will determine the lowest torque values to pass the NFPA/T2.6.1 R1-1991 standard titled “Fluid Power Systems and Products- Methods for Verifying the Fatigue and Establishing the Burst Pressure Ratings of The Pressure Containing Envelope of a Metal Fluid Power Component”. Additional testing will be conducted to determine Proof and failure pressure of the plugs. Fatigue, Endurance, Proof & Burst and 2,000,000 Cycle test data. EPCO Products, Inc. contracted the Fluid Power Institute® to evaluate the performance of eight different SAE fitting sizes with 3 samples of each size plugs under controlled fatigue, proof, and burst testing. The Fluid Power Institute® established the minimum torque values required to seal EPCO Products, Inc. aluminum Zero-Leak Gold® Plugs in SAE ORB J1926 ports at rated pressures. Testing was performed on plug sizes –02 through –12, testing (3) samples of each respective size. Once the minimum torque value had been established for each plug size a 2,000,000-cycle endurance test was performed on each selected plug size. The objective was to determine the minimum torque values for the aluminum Zero-Leak Gold Plug fittings as supplied by EPCO Products, Inc. Three samples of plug fittings, sizes ranging from -02 to –12, were torqued to a percentage of prior test results. With the plug fittings at their minimum torque values they must complete a 1,000,000-cycle pressure fatigue test in accordance to NFPA fatigue standard T2.6.1R2-2000, a proof test in accordance to the SAE J343 4.2 MAR 1999, and a burst test in accordance to the SAE J343 4.4 MAR 1999. EPCO Products, Inc. Zero-Leak Gold Plugs have been identified as a replacement and improvement to the standard hollow hexagon plugs manufactured to SAE J514 presently used within current end fitting terminations. The Zero-Leak Gold plugs are fully interchangeable with standard SAE J514 plugs and can be utilized in the standard SAE J1926 ports currently machined in end fitting Jackets and Bodies. The Zero-Leak Gold Plugs have been developed and subjected to testing (internal pressures—refer to the Fluid Power Institute test data); however, the customer required confirmation of the plugs suitability to withstand external pressure (hydrostatic) equating to and exceeding the customer’s current deep-water qualification. Zero-Leak Gold plugs are interchangeable with standard port entry plugs. Plug can be resealed repeatedly without loss of effectiveness. Effective in vibration, temperature variation, and pressure spike situations. Maximum gap minimization is achieved by optimal application of the geometric principle of the taper. The purpose of the test is to prove the integrity of the Zero-Leak Gold plugs when independently subjected to both internal and external pressure. This paper discusses testing methods for a new style of fittings. New and revolutionary designs in fittings, sometimes, do not apply to stated standards and protocol for testing. In these situations a “hybrid” testing protocol is used to validate the hydraulic conductors and fittings. Existing standards and specifications will be examined to show how the protocol is not applicable, and recommendations made to adequately cover the intent of the official testing protocol.